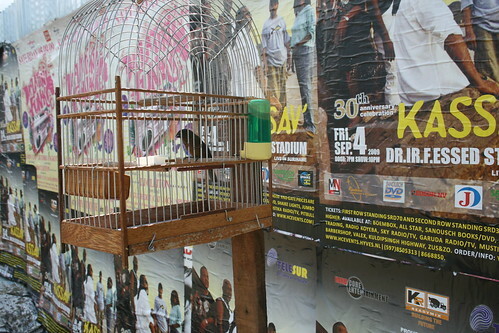 While photographing a Kassav concert poster in Paramaribo, I noticed a bird cage hanging nearby. The owner informed me that his bird could sing anything, even Kassav, if I wanted to hear. This was the same kind of seed bird one finds in Trinidad in similar cages — birds that are walked and sunned obsessively by their keepers — birds for whom music is often played to motivate them to trill, or “shine”, as we say in Trinidad. I began to wonder if the ones at home could sing David Rudder, Jah Cure, or Kassav. Many of these birds fly over to Trinidad from the continent and, sadly, are sometimes brought over by smugglers. I wonder what tunes they carry in their heads if they have been moved from one forest, urban space, or state of captivation to another? 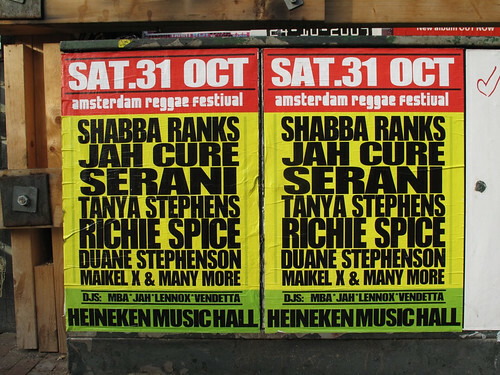 This was on my mind walking through the streets of Amsterdam a couple of months later, when I came upon a poster for a reggae event. There is a way that Caribbean music or musical interests create a seamlessness between locations. The dance-floor, the beat, is always there; wherever the people settle and or pass through, from island to island, from islands to continents. This sense of a presence is always there ... this visibility or audibility often defines the world in which we find ourselves, whether in concert halls, from car stereos and radio stations, or inside our iPod in the subway, tube, or tram. The playbills, the posters map out this transnational dancehall. This heartbeat, as Africa and India become processed or process their influences, seems to be everywhere now. How is contemporary visual practice to be understood through its dialogues and contexts in comparison? 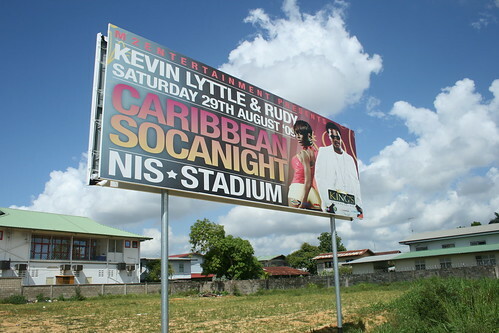 Vybz Kartel was just in Trinidad, while in Suriname I saw posters for Kassav, and friends were flying over to Curaçao to catch a performance of Juan Luis Guerra. The electronic voice from the GPS system giving directions in a car in London was programmed to have a London-Jamaican accent! A thumping car passes outside as I make this note ... if I close my eyes, where could I be within this moment? 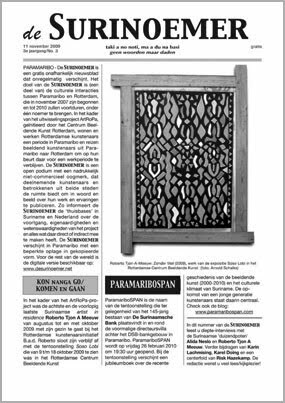 The November 2009 issue of De Surinoemer has been released online. It features interviews with artist Roberto Tjon A Meeuw and theatre practitioner Alida Neslo, a poem by Karin Lachmising, and Dutch artist Risk Hazekamp's Let Them Talk. De Surinoemer is a free journal published at irregular intervals, documenting the ArtRoPa project. It is distributed in Paramaribo in a limited-edition printed version, and online in various formats (text, PDF, JPEG) at www.desurinoemer.net. 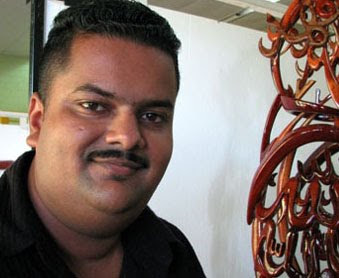 The young artist Rahied Abdoel is participating in the National Art Fair of Suriname for the first time this year. His work is in the first area I visit in the exhibition hall. In a split second, the piece on the right-hand side, an arrangements of wooden gearsticks, takes my full attention and it stays there for a while. The piece does not tell exactly what it is. It could be a display of functional handmade objects, or a nice poem about movement, but it could also be an altar for all the victims of traffic accidents in Suriname, more than two deaths a week lately. Or is it a display of objects to show off the status symbol of a car? Or is it just functional? The piece refuses to be an explanation of a single thought. The artist is standing next to me as I talk to myself, obviously a little too loudly. So he introduces himself. He is self-taught. In the art fair catalogue, Rahied is listed as a painter. His work is installed in the painting section of the exhibition hall. I ask him why. He tells me his work started with charcoal drawings. This year he started to make wooden pieces. He draws with wood and on wood, making sculptures, clocks, wall pieces with text, walking sticks, and gearsticks. 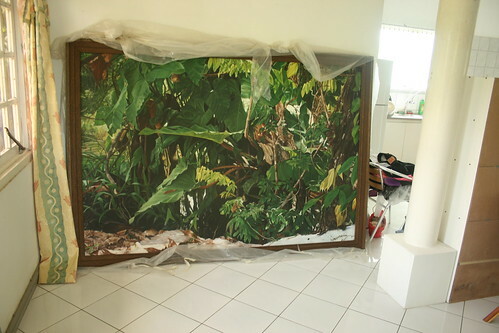 Every work is well-polished and covered with a layer of two-component varnish. For Rahied, it is even important that the back side of a two-dimensional wooden wall piece is polished well too, even though no one may see it. He says he develops an idea for a work in close harmony with his parents and younger brother. You could say the process is almost democratic. The religious background of the family plays a key role in what he makes. Most of the work refers to the Koran, to his Islamic faith. His favorite three-dimensional piece is an assemblage of prayers in wood, presenting a man who confesses his faith. I ask him about the gearsticks. This was his idea. 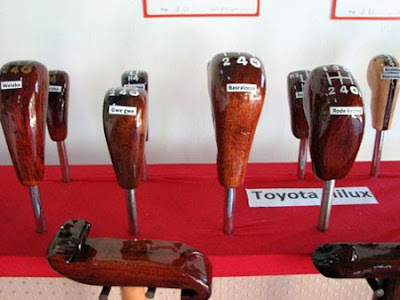 He knows about handmade wooden gear sticks for the luxury cars. Outside Suriname this is a very niche product. 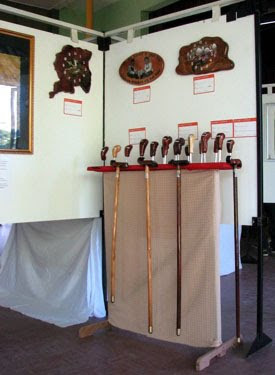 He displays them together with his walking sticks for aesthetic reasons, and he prefers to show his wooden objects on a red surface. I ask him what kind of work he plans to make next, after the art fair. Rahied says he wants to show his personal environment in a different way, or to transform his environment. I’m very touched by the display.